I am happy to share another of my low vis A-7E’s. The first one I posted a while back was a Desert Storm A-7E, and I didn’t have much luck with photographing the intake – or the photography of it in general! I think this upload is better- even though I didn’t use natural daylight- I have wanted to post my completions of the last 4 months or so- I am happy to be building more regularly now.Unfortunately, that means shooting indoors with the best lighting I have, otherwise the timing to shoot during the day never seems to work out! I have two more kits lined up to join this one eventually for a 1988 Praying Mantis diorama- a KA-6D and an A-6E. I was in college in 1988, and was enthralled by the use of the Viet Nam era aircraft in low viz livery. After doing more research, I found out that one of my favourite squadrons: VA-22 was involved in the conflict. 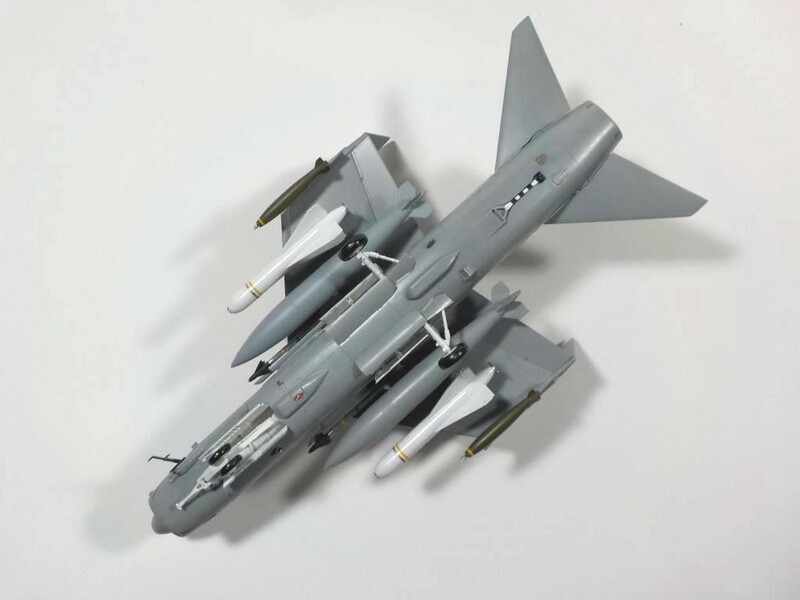 I loaded my A-7 with AGM-62 walleyes- even though it was more likely that they carried only one, I still loaded two- I am a s****r for symmetry. 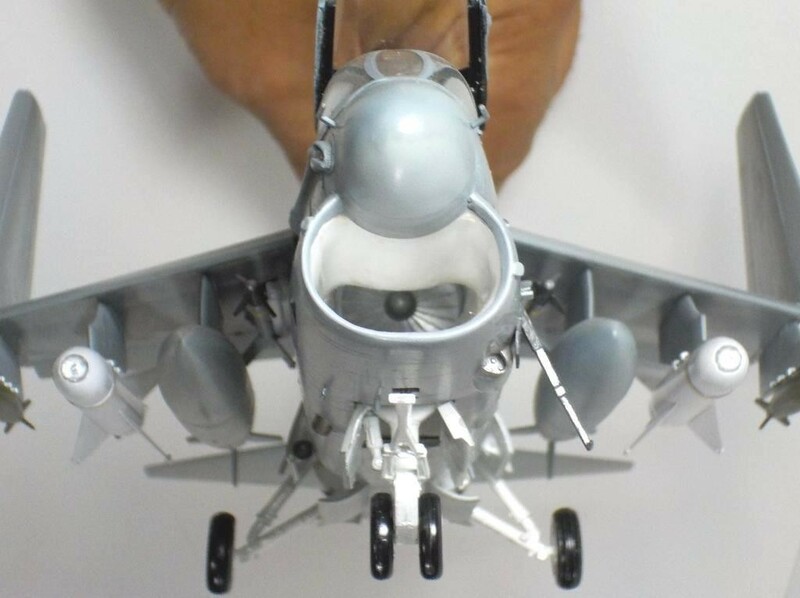 I like to put a fan at the back of the Hasegawa A-7 intake- can’t understand why Hasegawa did not provide one in the kit- but they did the same with their Legacy F-18 kits…intake but no fan?!? The Low Vis A-7E’s had a different seat from the earlier A-7E’s. the Hasegawa rendition of the seat is okay…but needs some rework and additional details to make it look like the real seat. I used a Black Box cockpit that I had lying around, but I think the Hasegawa cockpit is really nice out of the box- except for the seat. This kit fell about 4 feet during some of the finish stages- I had to repair and reassemble some parts two times. By fixing the damage, the kit was more of a triumph, even though I felt like an i***t for letting it fall in the first place! 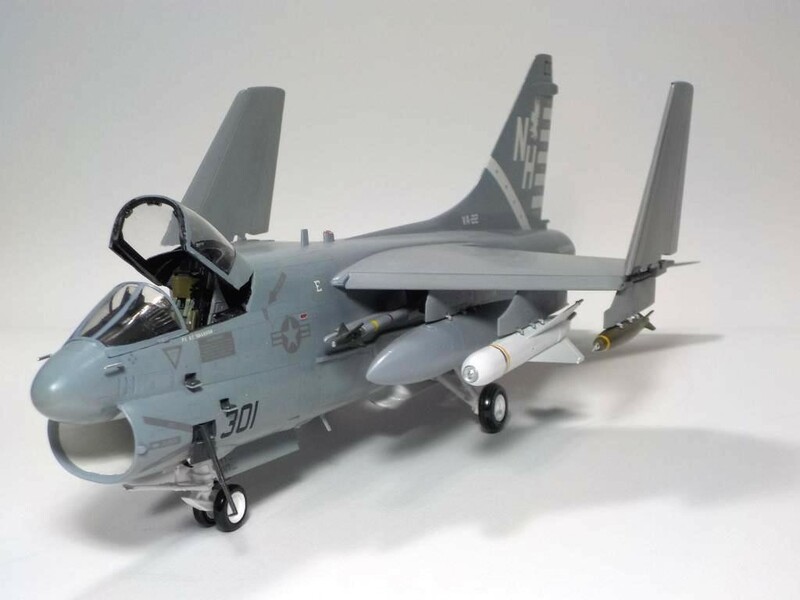 Hopefully, next summer will be the “summer of the Intruder” for me- I hope to get the A-6E and KA-6D done by then so I can have the diorama done at Christmas- I have to do all my major model work during school holidays- I am a High School Art teacher. A nice, clean build with some equally nice photographs….I like it. I will be using the Monogram/Revell intruder kit. While there are some detail issues (including a very shallow depth intake) I had already heavily invested in Monogram intruders before the new kits came out…meaning i can’t afford to “upgrade”. No problem, because learning about the fixes and fixing them is part of the fun. I have one more low vis A-7 coming, an EA-7L. Love the A-7. Nice and clean work. The photography is very well done and looks like a clean job. Thanks for sharing the pictures. Hi Dan. 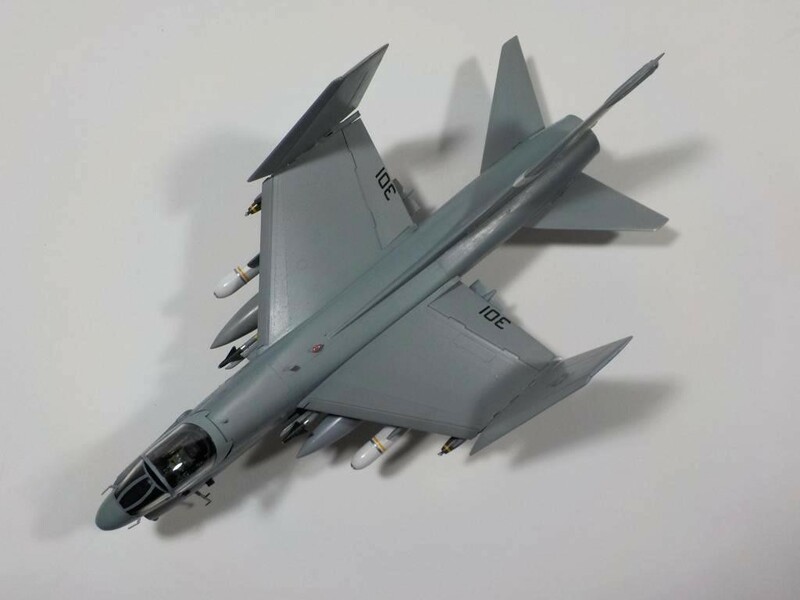 I can’t claim any expertise with jets apart from making sure the cans go at the back… This looks like a clean build but I’d suggest a little additional lighting as the model looks quite dark to the eye, and I don’t think it’s just the shade of grey used. From the strong shadows on the deck I’d guess you used a bright overhead light. As well as the overhead, try a couple of simple lamps, maybe the sort used for bedside tables that have a hood that forces the light in the opposite direction. Place these either side at 45 degrees from front centre. You should then be able to brighten the whole scene and lose the direct shadows. Also, I use a piece charcoal grey poster board (£2) as a background as it’s neutral and any shadows tend to disappear. You can even used a small hand-held light to pick out any detail with a macro lens for showing off all the work you’ve done to the cockpit. PS maybe matte-down the tyres? Thanks VERY much Rob. I am dealing with a little rinky-dink camera as well, but obviously the lighting is the main issue. I have reconfigured and will have 2 45 degree lights and one more as a fill- that should solve most of the issue I have. Unfortunately, I did not grab the very large roll of paper from work and cut a section off it for the backdrop- instead i thought two large sheets of watercolour paper would do! 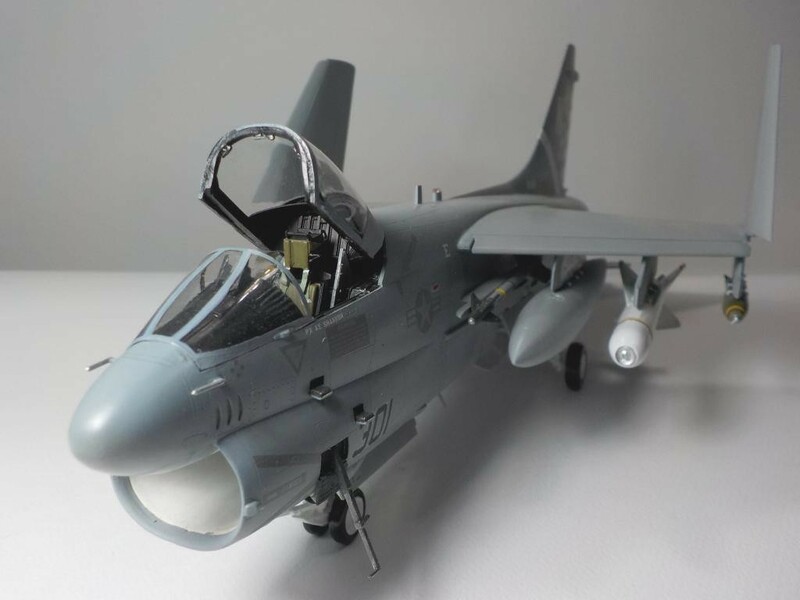 I will post another build sometime today, with the extra light, and I might reshoot the A-7E as well and replace the pictures that are on there now. Tried the Macro setting with the little camera but not 100% successful each time I shot- I should be taking over the wife’s Nikon Digital SLR which should solve my other issues as I will also use a tripod. What it boils down to for me is that I am so glad to finish this kit. I didn’t stop to take a picture of the reworked seat because I wanted it together and off the bench! I should be able to take more time to record build steps as i think they help people the most on these sites. I was happy with the post I did for my Ta-152 for that sort of presentation. 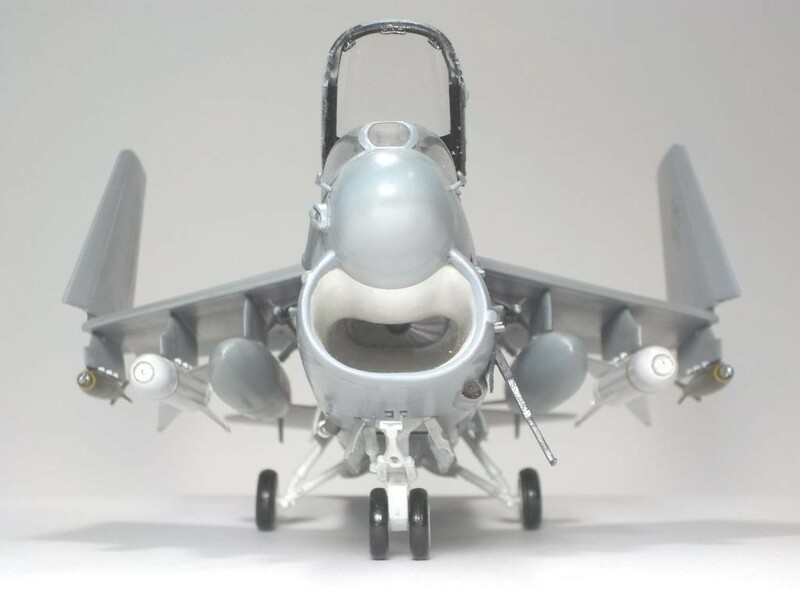 I will be shooting a bit of my “in progress” EA-7L as the resin conversion i am using has a few issues that would be good to show people, although many would just use the Hobby Boss two seaters now- out of the box- even with their problems. Your advice means a lot (knowing who you are! )- especially the tires- I had been using Humbrol 75 for years for that, But I like the look of the Testors black chrome trim for rubber- just realized that by accident in the last two weeks. I will brush some flatish clear on the tires if I reshoot. My photography needs help too, Rob’s suggestions will be used on my next “shoot”. If you want to cheat though, take the model outdoors, natural sunlight seems the best lighting. Nice build on the model, perhaps some “new” photos will bring out all the detail! Not sure about the outdoors stuff. It’s so generalised that you can lose control of the subject. The sun is the sun, big and bad for modelling photographs, especially at our hobby level. The only guarantee is to do a setup which gives you the image authority for a good result. Naturally, many people invest in serious setups and equipment but I just use a standard digital camera with a few basic lights and backgrounds and usually get an acceptable result. Thanks, Mike I will definitely try and get the photography improved. If i do the sun it will depend on how intense it is on any given day. It can be pretty intense in Bermuda! Dan, you could run your photos through a photoshop program to get a bit more light and detail if you think they are a bit dark. I did one of your photos and it was easy to improve the detail. Nice model nonetheless. Thanks Jack i will definitely be doing something as these comments are encouraging me to up the game on presentation -especially photos. Good looking A-7. I like the low-vis scheme. Air guard used to fly them here in Tulsa before they transitioned to the F-16. It seems like we got to see more of the A-7’s since they were slower! The F-16’s go wheels up and hit altitude so fast they are gone before you know it! I like the A-7 as a subject since it was another used by multiple services, allowing for more variety of livery. I build an old AMT kit in two-tone greys, and have a couple more – probably do a Navy and perhaps an SEA Airforce. I have a usaf vietnam D in sea scheme and an E in the gray/white scheme. Have a number of them in line to get built. Puerto Rico flew them too! Nice and clean build and well captured, Dan !